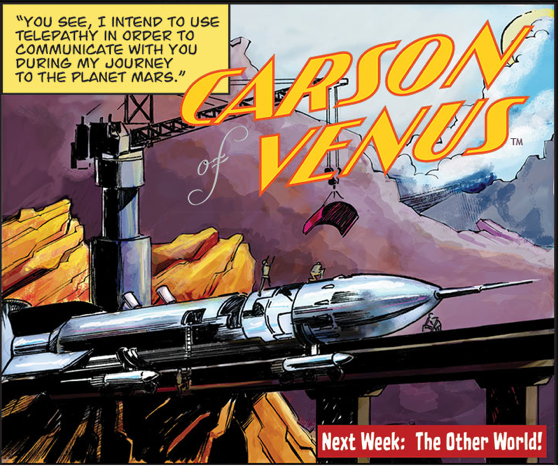 This just in from Edgar Rice Burroughs, Inc.
We are expanding our existing Tarzan (R) online comic strip with Carson of Venus (TM), an all-new, full-color online weekly comic strip of interplanetary romantic adventure brought to you by writer Martin Powell, illustrator Tom Floyd and artist Diana Leto. Join the excitement. Start reading now at www.edgarriceburroughs.com/comics ! For just $1.99 per month you will have access not only to the upcoming Carson of Venus strips, but all current Tarzan strips by Tom Grindberg and Roy Thomas, numerous Bonus Materials and sketches, as well as other fantastic strips such as The Eternal Savage, coming soon! Don’t wait, Subscribe Today and watch for more announcements on June 16th! James J. Sullos, Jr. | President | Edgar Rice Burroughs, Inc.
Martin Powell has been a professional writer since 1986, having written hundreds of stories in numerous genres, for Disney, Marvel, DC, and Sequential Pulp/Dark Horse Comics, among others. Nominated for the prestigious Eisner Award for his work with Sherlock Holmes, he has written for some of the most popular characters in the industry, including Superman, Batman, Popeye the Sailor, and Tarzan of the Apes. He’s also the author of many children’s books and is co-creator of the acclaimed Halloween Legion, with illustrator Diana Leto. Powell’s The Tall Tale of Paul Bunyan won the coveted Moonbeam Children’s Book Award for Best Graphic Novel of 2010. Tom Floyd is a self-professed jack of all trades. He has been everything from a Texas oilfield roustabout, a mechanic, a soldier, a printer, and a public school art teacher. Finally settling down some 14 years ago as a graphic designer-illustrator-animator for a PBS station. He has worked on productions from local programs to Reading Rainbow, NOVA science NOW, and American Experience. But throughout all of this he remained a comic fan, artist and writer working for companies such as Elite Comics, Eternity, Moonstone, and Marvel. He was honored in 2010 to receive the Burroughs Bibliophiles Golden Lion Award for his illustrations for new Bison Books editions of the Moon Maid, Pellucidar, The Eternal Savage, and Pirates of Venus. He has also written and illustrated an on-line web comic Captain Spectre and the Lightning Legion, which is a pulp/serial/adventure comic. Captain Spectre is located on the web at www.captainspectre.com/. You can also follow along with other of his projects at his sketchblog lightninglegion.blogspot.com/. Diana Leto has been a professional artist and graphic designer for over a decade. Her illustration has illuminated projects at institutions including The Jim Henson Legacy, Sesame Street and Sequential Pulp/Dark Horse Comics. She is co-creator and illustrator of the Halloween Legion, a critically acclaimed all-ages mystery/adventure series featuring “The Worlds’ Weirdest Heroes.” Presenting contemporary design at Adobe MAX, addressing teachers and children about being a woman in the arts at KIDS’ COMIC CON and helping refresh beloved characters for a cultural institution, Diana’s artwork stands at the intersection of education and inspiration. Copyright © 2013 Edgar Rice Burroughs, Inc, All rights reserved. You are receiving this email because you are a subscriber to the Tarzan Comic Strip. I couldn’t resist a Carson comic strip!! Well, except I have a red cross when I try to view it. Am I the only one with this problem? The Tarzan comic strip is great, I love the art so far.